Some people are naturally hot sleepers, and they may get poor rest each night because of it. If you fall into this category, you may feel like you have no hope of enjoying a sound night’s sleep. But here’s the good news: There are several mattresses that directly address the issue of sleeping hot and provide a cool sleeping surface. 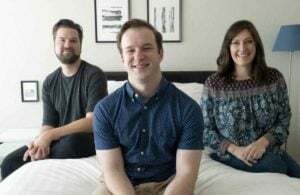 If you’re in the market for a mattress that will help you sleep cool, it’s critical to confirm that the company responsible for making a given mattress has directly addressed the issue of sleeping hot in the construction of its mattress. Otherwise, you might be at risk of getting a mattress that sleeps hot. Not sure where to start? Read on for our top picks for the best cooling mattresses around. 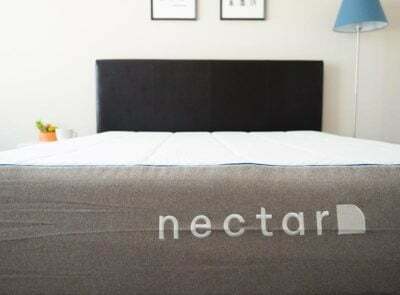 Nolah is a very comfortable mattress that is not made with any heat-trapping chemicals. 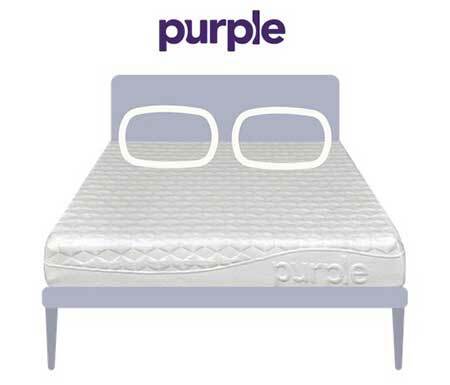 Purple's top layer makes the mattress completely temperature neutral, meaning there's no risk of sleeping hot. Amerisleep provides the coolest-sleeping memory foam mattresses on the market. 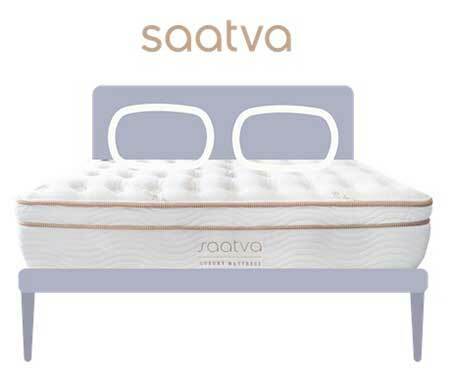 Saatva's spring mattress is a great fit for all three sleeping positions and will not sleep hot. 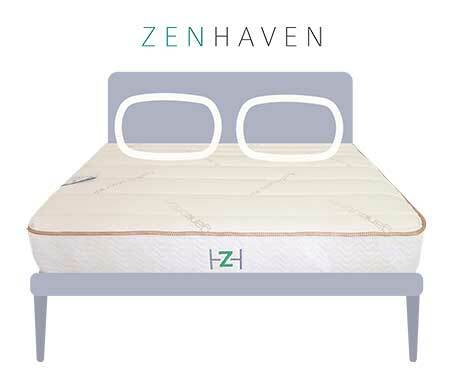 Zenhaven is an all-natural mattress that doesn't sleep hot and is a good balance of comfort and support. 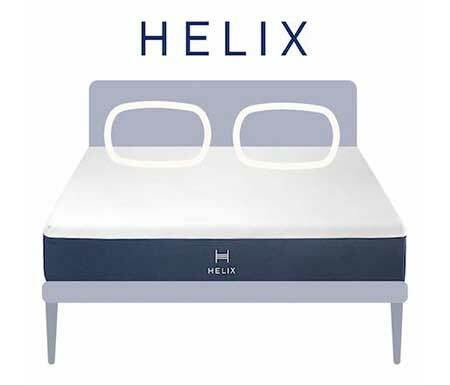 Helix provides customized mattresses that can directly address the issue of sleeping hot. There are several types of mattresses that may be ideal for hot sleepers. We chose to keep this list on the shorter side, but it’s by no means exhaustive. 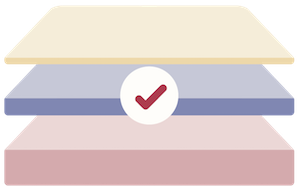 There are other mattresses out there that can help with sleeping cool, but this list will give you starting points for multiple mattress categories. 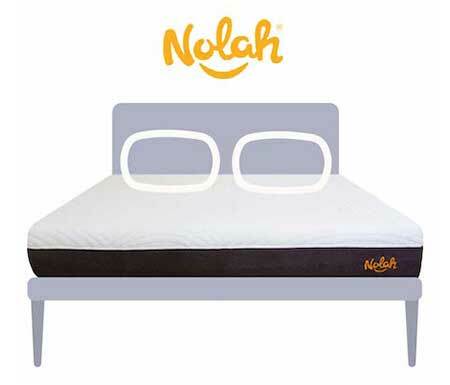 In our opinion, Nolah is the most effective foam mattress for sleeping cool. This opinion is based on our personal experiences on the mattress as well as the mattress’s design and construction. The mattress is completely temperature-neutral. The company has written a nice blog post describing exactly why this is; we encourage you to check it out. Long story short? 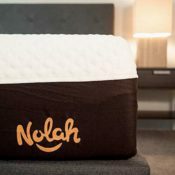 Nolah doesn’t use heat-trapping chemicals in its mattress, which helps ensure the mattress doesn’t store heat. Additionally, Nolah uses materials that are designed to dissipate body heat faster than traditional memory foam. Bottom line? You won’t sleep hot with the Nolah. The foam in the top layer is made without heat-trapping chemicals. This makes for a temperature-neutral sleeping surface. The mattress relieves pressure very well. This makes it a very good choice for side sleepers because it should relieve pressure on the shoulders, hips, and knees. Heavier-weight sleepers can get a great experience from their new Signature model as well. The mattress has greater durability overall than many of its all-foam competitors. Purple uses a different material in its comfort layer; this material is a hyper-elastic polymer. That might sound like gibberish, but here’s the takeaway: One look at the grid formation of the material and you’ll quickly see why this mattress sleeps cool. The open space lets any potential heat flow right through. 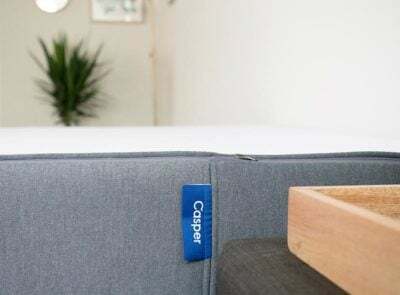 In our experience (which is backed up by other customer reviews), the mattress is basically temperature-neutral, so you won’t have any issues with sleeping hot. What Makes Purple Stand Out? The gel material in the top layer is completely temperature-neutral. It is built in a grid format that allows for maximum airflow. The gel material is both supportive and pressure relieving at the same time. This makes it a great choice for people sleeping in any position. For this reason, it may be an especially good choice for combination sleepers. The mattress is more durable than most of its all-foam competitors. The new Purple mattress is especially good for heavier-weight sleepers. 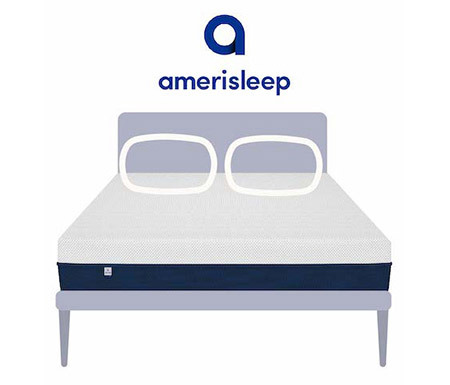 For memory foam mattresses, I think the Amerisleep AS4 goes the furthest in ensuring a cool sleeping surface. The mattress has a celliant cover. Celliant is a type of fabric that can potentially maintain a cooler sleeping surface. The memory foam is partially plant-based. Studies show this is an effective way of keeping cool. The foam has something called surface modification technology, which consists of channels cut into the foam to allow for more airflow. The memory foam is also very open-celled, making it much more breathable than typical memory foam. When you add up all of these factors, it makes for a pretty cool sleeping surface. The mattress features a Celliant cover. Studies suggest Celliant may offer certain health benefits (such as improved muscle recovery for athletes) and provide a cooler night of sleep. The mattress uses open-celled memory foam and has air channels that allow for airflow. Overall, it is one of the coolest sleeping memory foam mattresses out there (if not the coolest). The memory foam relieves pressure very well. As a result, this mattress is an especially good choice for side sleepers. Saatva is an innerspring mattress with “coil on coil” construction, meaning it features two sets of coils that sit on top of one another. What this means in practical terms is that there is a ton of airflow in this mattress. While there is foam on top of the mattress, it isn’t so thick as to affect the sleeping surface temperature. You can see in the picture to the left that there is a ton of empty space around the steel coils at the bottom. The second layer of coils are individually wrapped, but there is still a lot of room for air to flow in between the rows. It features a “coil-on-coil” construction that allows for a high amount of airflow. It is a highly supportive mattress that can be especially good for back and stomach sleepers. The mattress is a great value. 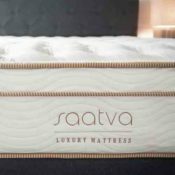 A comparable mattress found in a retail store would probably cost at least twice as much as the Saatva does. 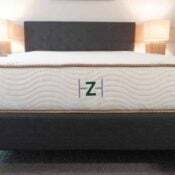 Zenhaven is an all-natural latex mattress. Natural latex is very breathable and typically isn’t associated with any complaints of sleeping hot. True to form, this mattress is very breathable and provides a cool sleeping surface. If you look at the latex itself, you can see that there are little pinholes across the surface of the foam. This is just an extra way to let air flow through the mattress and make sure that the sleeping surface temperature never gets too hot. What Makes Zenhaven Stand Out? It is flippable, meaning it has both a firm side and a soft side. This helps maximize the chances that you get the right firmness level for you. It contains natural latex which is open-celled and very breathable. There should be no issues with sleeping hot with this mattress. The mattress will be more durable than many of its competitors. If you are looking at your purchase as a long-term investment, then the Zenhaven really stands out. The sleeping surface is immediately responsive/bouncy. Whether that is a good thing comes down to personal preference, but many people will like this aspect of the mattress. 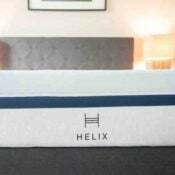 Helix is a unique company because they customize their mattresses to each individual’s preferences. In the case of hot sleepers, they can make a mattress that directly addresses that issue. Overall, it’s a really solid mattress that has a very cool concept. The mattress is customizable based on the answers you give during a sleep quiz. 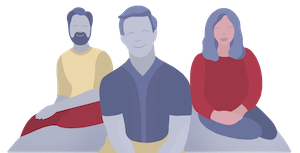 You can state that you want to sleep cool, and the company will create a mattress that directly addresses the issue. This mattress is great if you are really unsure what type of mattress you want to get. It can really eliminate the guesswork by allowing them to customize a mattress based on your needs and preferences. This mattress is great if you don’t believe that there is one best mattress for everyone. If you are a heavier person who wants a cooling mattress, you’ll want to consider a few extra factors. In particular, you need to make sure the mattress is going to be durable. This is because you’ll want to make sure the mattress can handle extra weight over time without sagging or compressing too quickly. Some of the online mattress offerings, for example, are made for people 200 lb or fewer. 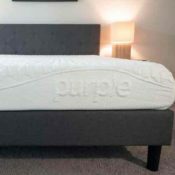 The Purple 4 has the same gel material as the original Purple mattress (which we wrote about earlier in this article). That means you get a temperature-neutral sleeping surface. You also get 4″ of the gel material, which means heavier sleepers are unlikely to bottom out and feel any pressure. The spring system is highly supportive, and overall it will be a very durable mattress (even for heavy people). 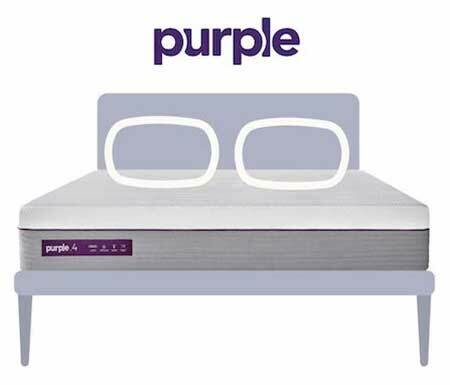 If you are a heavier sleeper who tends to sleep hot, then the Purple 4 mattress might be the way to go. In addition to seeking out a mattress that can keep you cool at night, you will also want to find a mattress that is a good fit for your sleeping position. If you are a side sleeper, then you will want to get a mattress that is a little bit softer than average and has a thicker comfort layer. It sleeps temperature-neutral, so you won’t have to worry about overheating. The mattress is softer than average, and the material in its top layer does an excellent job of relieving pressure. We didn’t feel pressure on the hips and shoulders when we slept on it, and it excelled during our pressure map testing. I would take a look at the Nolah if you don’t want to overheat and you sleep on your side. Memory foam is a very well-liked sleeping surface. It can be super comfortable, and it relieves pressure extremely well (probably better than just about any other material). As a result, memory foam has become extremely popular, and we are seeing more and more memory foam mattresses hit the market successfully. The biggest complaint people have about memory foam is its propensity to trap heat. Luckily, manufacturers have found many clever ways to address this issue. It uses a celliant cover, which can potentially offer certain health benefits in addition to regulating temperature. The memory foam is open-celled, meaning it is much more breathable than the average memory foam mattress. There are air channels in the second layer that allow for additional airflow. The memory foam is partially bio-based, which further improves breathability. 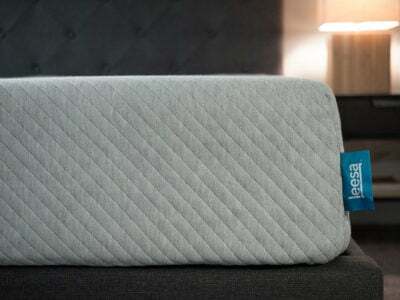 All told, the Amerisleep AS4 is a memory foam mattress that sleeps remarkably cool. If you need extra cooling, get this device. The best possible solution to sleeping at whatever temperature you want is to get a Bedjet. It is a device that offers climate control for your bed by blowing air of whatever temperature you want directly into your bed. That means if you are cold, you can blow hot air into the bed, and if you are warm, you can blow cold air into the bed. It’s highly effective: You can see how the Bedjet works HERE. A premium alternative to the Bedjet is the WinkBeds coolControl. See how coolControl works HERE. Consider a cooling mattress protector or mattress pad. If you are worried about sleeping hot, then you might want to consider a mattress protector. (There are several reasons why you should get a mattress protector, but this is just another reason you might want to consider it.) Most people get them to protect against dust mites, bacteria, and allergens. They also will keep your mattress clean and protect against spills and stains. The Bear mattress protector has a special fabric that can pull heat away from your body and keep you cool at night. Even if you sleep on a hot memory foam mattress, this protector can help regulate the temperature. Other options exist in the form of thin, electric cooling pads that lay across the surface of your mattress. Products such as the ChiliPad plug into your wall socket and allow you to choose your exact desired mattress temperature. If you’re trying to stay cool at night, you might also want to think about your sheets. While thread count usually speaks to the quality of your sheets, higher thread count sheets are usually less breathable than lower thread count sheets. This is because the high thread count sheets are denser and allow less air to pass through. You should also think about the fabrics used in your sheets. Although synthetic materials are cheaper and thought to be lower quality, they may actually be more breathable. Microfibers leave more room in their weave, which allows for more air to pass through. You will likely trap less heat when sleeping under synthetic sheets. That being said, there are natural fibers with cooling properties. Bamboo sheets, for example, are durable but also quite breathable. You can read about the best bamboo sheets here. Does Your Mattress Firmness Affect Your Body Temperature? We have discussed how different mattress designs deal with overheating. However, what about mattress firmness? Which is better for hot sleepers: a firmer or softer mattress? A softer mattress can mean good pressure relief, but it may also mean more heat. Especially with most memory foam mattresses, the more you sink into your mattress, the hotter it can get. It may feel nice to be enveloped by your mattress, but you are also getting more contact with the heat-trapping memory foam. This is not to say that a softer mattress cannot sleep cool. It is just another factor to consider during your buying process. On a firmer mattress, you are going to sleep more “on” the surface rather than “in” it. Because of this, you will most likely be sleeping cooler on a firmer mattress. You are less surrounded by the mattress, and there is more room for air to flow on your skin. When thinking about mattress temperature, you should also think about your body weight. If you are a heavier person, you will sink into a mattress more than someone who is lighter. What Kind Of Mattress Cover Should You Get? Non-quilted covers are usually going to be thinner and more breathable. They allow you to interact with the layers of the mattress and shouldn’t interfere with heat dissipation or airflow. Quilted covers consist of cover fabric that is quilted together with another material, most likely foam. While this usually adds extra pressure relief, it can also heat up your sleeping surface even more. It can cut down on breathability and stop cooling foams from doing their job. If you sleep hot, it may be best to stay away from quilted covers. What Fabrics Can Help Keep You Cool? Along with the overall style of the cover, you may also want to consider what fabrics are used in its construction. Celliant. This fabric is designed to transform your body heat into infrared energy. Instead of trapping heat, it redirects the energy back toward your body. This may increase muscle recovery and blood flow, and the increased blood flow can help your body regulate temperature better while you sleep. You can read more about how Celliant works here. Tencel: Also known as Lyocell, this fabric is made from the wood fibers found in eucalyptus trees. It is designed to be very breathable, which helps prevent the mattress from trapping heat. Lycra: Also known as Spandex, this material is breathable and wicks moisture away from your body. It can be found in some mattress protectors. How About Phase Change Materials? In some mattress protectors and pads, you may find something called phase change materials. To understand how they work, think of water and ice: When it gets too cold, water turns into ice. When it warms up, the ice turns back to water. That is how phase change materials work in bedding, mattress protectors, and mattresses. They change from one state to another as your body temperature changes. They actually pull heat away from your body and store it if you are sleeping hot. If you get too cold, these materials release the stored heat to warm up your body. You can read more about phase change materials here. If you find that you are waking up in a pool of sweat in the middle of the night, your mattress may very well be the reason. However, you might also want to consider what type of pillow you are sleeping with. Your pillow could easily be one of the reasons why you are overheating. There a few different ways pillow manufacturers can address this issue. From our experience, if you are looking to get a pillow that will keep you cool, you should check out the Bear pillow. It is very cool to the touch, and it is also a very comfortable pillow overall. How Do Different Mattress Types Perform? Innerspring. Innerspring mattresses generally do pretty well with sleeping cool. That’s because the mattresses have space for air to flow between and through the coils. One possible exception to this rule: If there is a lot of foam sitting on top of the coils (such as in a hybrid mattress), this may inhibit airflow and make the mattress less cool. Latex. Latex generally doesn’t have heat issues because of its chemical composition and because it usually has air holes punched in it. Some synthetic latex mattresses can potentially be the exception. Mattresses that combine latex with memory or poly-foam might have issues with sleeping hot as well. Memory foam and poly-foam.This tends to be the mattress type that receives the most complaints about sleeping hot. 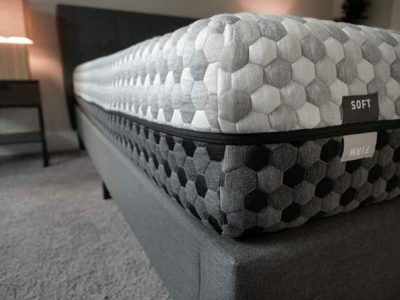 With these types of mattresses, you’ll want to make sure the company has done something to address this issue, such as creating a more open-celled structure in the foams, having a certain type of fabric in the cover, infusing gel into the foams, or using plant-based foams. Gel memory foam. Memory foam is known to trap heat, so many mattress companies have begun incorporating gel in their memory foam. Gel is meant to dissipate heat, but its effectiveness is not always clear. Gel can take on the heat of the foam, and while it may warm more slowly than traditional foam, it may not actively cool you while you sleep. You can read more about the properties of gel memory foam here. Note: These are general statements regarding whether or not a mattress will sleep cool. Sleep temperature depends on a lot of different factors, so take these as general guidelines instead of hard-and-fast rules. Why Do We Sleep Hot In The First Place? One of the main reasons we sleep hot has to do with how our body acts during REM sleep. When we are in this deep stage of sleep, the temperature-regulating system in our brains is asleep as well. Because of this, our bodies usually match the temperature of our bedroom. When we sleep, we release heat and our mattress, bedding, and pillows trap it. Materials such as memory foam are especially known to trap this heat. Also, certain types of bedding can prevent airflow. Since our body isn’t regulating our temperature while we are asleep, these materials can cause us to overheat. Anxiety. People who suffer from anxiety can experience fluctuations in their body heat. During anxious moments, they can experience something akin to hot flashes. If these hot flashes occur at night, they can cause people to wake up or have trouble going back to sleep. Hyperthyroidism. The thyroid gland produces the thyroid hormone, which, among other things, helps to regulate body temperature. With hyperthyroidism, the gland produces too much of the hormone, and this can cause people with the condition to feel overheated. Menopause. Women who are just beginning their menopausal transition can sometimes experience hot flashes. These occur as estrogen levels change and a feeling of intense heat comes on. These hot flashes can cause night sweats. Medications. Some prescription drugs have also been shown to cause night sweats. 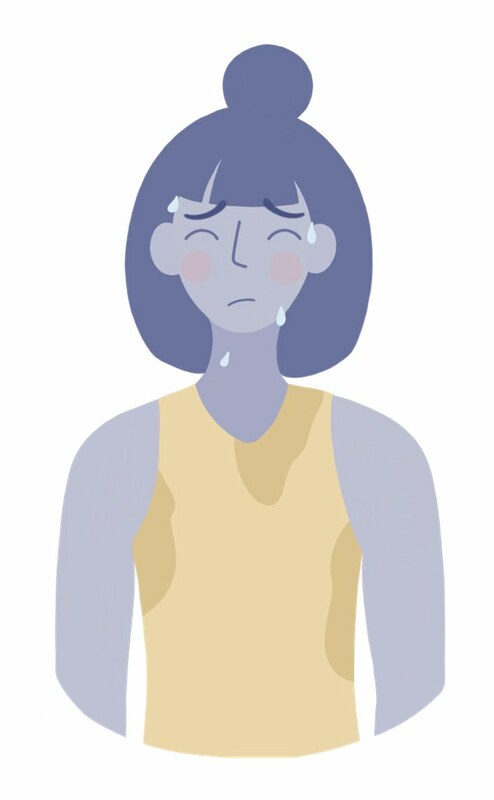 Antidepressants and other psychiatric drugs can lower norepinephrine levels, and this can lead to excessive sweating during the day and night. Other Conditions. There are several other health conditions that may affect body temperature, thereby causing people to sleep hot. For example, Graves’ Disease, Multiple Sclerosis (MS), and some forms of cancer are accompanied by fluctuations in body temperature. There are lots of great cooling mattress options out there, and in fact most of these mattresses are some of the best mattresses overall. The No. 1 thing you should look for is whether a company has explicitly tried to address the heat issues in the construction of its mattress. After that, reading as many reviews as possible is another good way to make sure you’re making the right decision. We are looking for a new mattress. We currently have a natural latex. It’s perfectly supportive but too hot. We both sleep on sides and back. I looked at the Zenhaven but am concerned about heat. 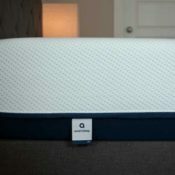 Would you have any information on the Brooklyn Aurora mattress? We reviewed that one here, https://www.mattressclarity.com/reviews/brooklyn-bedding-aurora/. Here’s the reality! My husband and I share a bed. He is not a hot sleeper. I am and have been miserable ever since our purchase. Brand doesn’t matter. If the people testing them are not hot sleepers to begin with then they can not give accurate advice. That is false. It is pretty easy to assess breathability. For example, Purple has a grid structure that allows for maximum airflow. You don’t need to be a hot sleeper to understand that. Hey Joe, we bought a Sleepy Cool King size mattress and it sleeps hot, whats your best cooling mattress pick? Any of the ones listed here should be great for cooling. We just purchased a Beautyrest Natasha Plush Black Lux Plush Pillow Top (Whew! )… not yet delivered and the store we purchased it from said there is NO RETURN if you are unhappy with your choice, other than the 1 1/2″ indention defect. I noticed several people said they were considering exchanging their mattress. Has the store we purchased ours from mislead us? I’m not sure but it sounds like maybe they have. Try the Purple. It’s temperature neutral and is a good fit for side sleepers too. Funny to me, how almost every website I go to, to find out about the “Best”, Coolest, or most comfortable mattress , only have the mattresses that are sold “Online”. Even though the mattresses “Online”, are a small fraction of the mattress market! Seems very fishy! That’s because they represent the vast majority of the mattresses we review. What about the Active X bed from Nest Bedding?